Ionamin® users had an increase in metabolism of 22% in just 45 minutes. 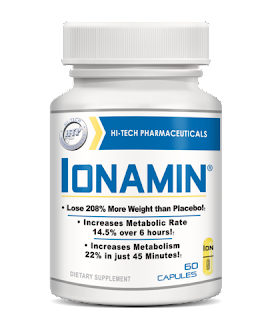 Ionamin® users lost 208% more weight and lost 385% more fat than users taking a placebo. Ionamin® was 66% stronger than 30mg Ephedrine and 152% stronger than 10mg Ephedrine. Ionamin® OTC is a revolutionary stimulant, fat loss aid, and helps people lose weight and feel great! Ionamin® works by mimicking the effects of our endogenous catecholamines such as epinephrine, norepinephrine and dopamine. The principal mechanism of its action relies on its indirect stimulation of the adrenergic receptor system, which is part of the sympathetic nervous system (SNS), by increasing the activity of noradrenaline at the post-synaptic a- and ß-receptors. Ionamin® has indirect sympathomimetic effects and due to its ability to cross the blood brain barrier, it is a CNS stimulant similar to ephedrine and other stimulants as it releases noradrenaline and dopamine. This helps you feel like doing more activities resulting in additional weight being lost due to exercise when combined with Ionamin® over the counter supplement. Ionamin® is a new weight and fat loss product from Hi-Tech Pharmaceuticals, Inc. ("Hi-Tech") that is the provides a rapid onset of explosive energy and thermogenesis. Ionamin® incorporates an advanced delivery system to put the ingredient powerhouse into action. Hi-Tech chose to use Explotab®, which is remarkably effective for rapid disintegration and enhanced dissolution. The mechanism by which this action takes place involves accelerated absorption of water leading to an enormous increase in the volume of granules. This results in rapid and uniform disintegration leading to increases in the metabolism by 22% in 45 minutes; study analyses revealed no significant differences between conditions at baseline in values of VO2, VE, or RER. Results indicated that VO2 change scores for Ionamin® OTC were significantly greater at all time points following ingestion (+22.1%, +18.9%, +15.9%, +12.6%, +8.4%) compared with PL (0.4%, -1.7%, -2.3%, -1.1%, 0.5%). Similar response patterns were observed for VE as VO2 with Ionamin®: (+26.6, +22.9%, +23.3%, +18.7%, +9.0%), and PL (-1.3%, -2.5%, -1.9%, -3.6%, +3.1%). The Ionamin® VE change scores were significantly greater than PL at 45 min, 90min and 3 hrs (p<0.05). The RER change scores with PL were within 2% of baseline values across the six hours of testing. In contrast, Ionamin® over the counter produced a pattern of declining values of RER over time to 9% and 11% below baseline at 4½ hrs and 6 hrs post ingestion, respectively, which were significantly less than PL. Ionamin® is a revolutionary stimulant, fat loss aid, and helps people lose weight and feel great, as shown in the change in mean total body weight of the Ionamin® group (-8.0 +/= 6.5 lbs) was significantly greater than the change in body weight observed in the Placebo group (-2.6 +/= 4.8) (p's < 0.05), and in the decrease in body fat weight observed in the Ionamin® group (-6.3 +/= 7.3 lbs) was statistically greater than the body fat weight loss in the Placebo group (-1.3 +/= 6.7 lbs) (p < 0.05). Ionamin® works by mimicking the effects of our endogenous catecholamines such as epinephrine, norepinephrine and dopamine. The principal mechanism of its action relies on its indirect stimulation of the adrenergic receptor system, which is part of the sympathetic nervous system (SNS), by increasing the activity of noradrenaline at the post-synaptic alpha- and beta-receptors. Ionamin® has indirect sympathomimetic effects and due to its ability to cross the blood brain barrier, it is a CNS stimulant similar to ephedrine and other stimulants as it releases noradrenaline and dopamine. This helps you feel like doing more activities resulting in additional weight being lost due to exercise combined with Ionamin® OTC. Ionamin® users saw an Incredible 16.6 % increase in Resting Energy Expenditure (Metabolism) over the first 3 hours with an increase of over 14.5% in Energy Uptake over the entire 6+ hours! These findings also indicate that Ionamin® produced a substantial shift in energy substrate utilization with significantly greater levels of fat oxidation. Copyright 2016 | Ionamin.org. Simple theme. Powered by Blogger.